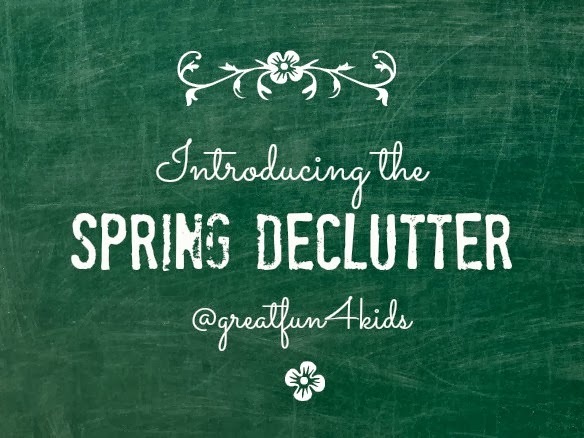 Welcome to the first day of our Spring Declutter! 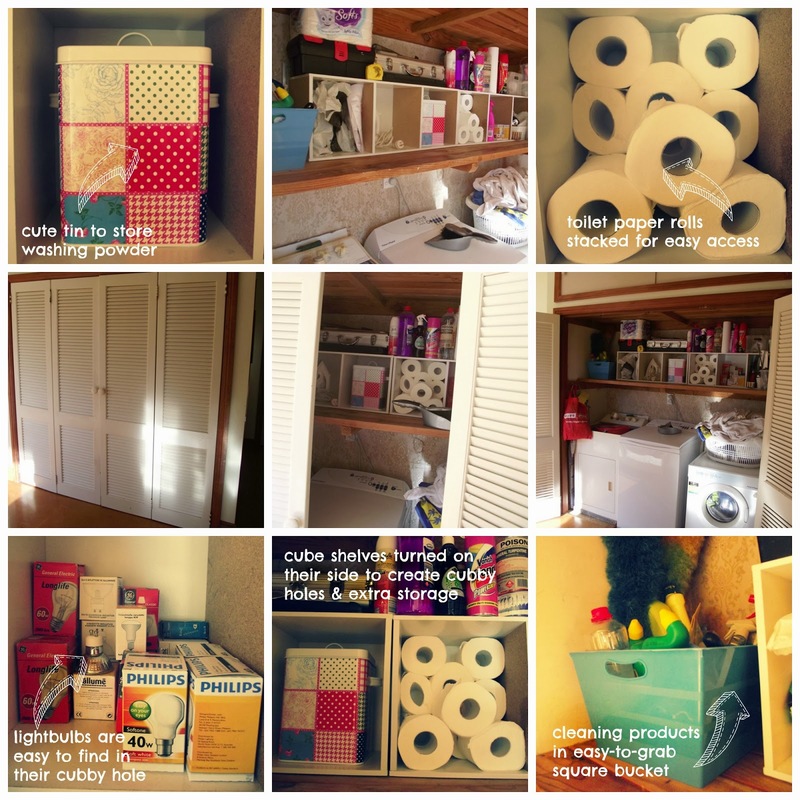 I am so pumped to make a start; I've had to put this off for weeks with being in hospital and recovery, and I am determined that there is now no better time to declutter and organise my house one zone at a time, with the help of my newfriend and partner in mess reduction, Professional Organiser, Natalie Jane. Mess has long been my nemesis. Look closely, it's even in the word: ne-MESS-is. I fight a losing battle with mess, as we all do. It's like the song that never ends, it just goes on and on my friends. I've come up with a theory. Why do I battle so much with mess? I have too much stuff. There are too many toys and not enough places to put them. Too much dirty laundry and not enough room in the washing basket. Too many clothes and not enough wardrobe space. Too much clutter, too much stuff, too much mess. I've been waiting to sink my teeth into this Decluttering project for months. The idea was suggested to me by the psychologist back when I was first diagnosed with Dyslexia. She suggested enlisting the help of a professional-declutterer to help me get things in my home-sweet-home into order, to help reduce "environmental stress" (cluttered house, cluttered mind), so I went on a Google hunt and landed on the webpage of Natalie's company, Be Organised. Since Natalie gives a free initial assessment and consultation, I figured there was nothing to lose in getting her over to survey the damage, and see how we could maybe collaborate. 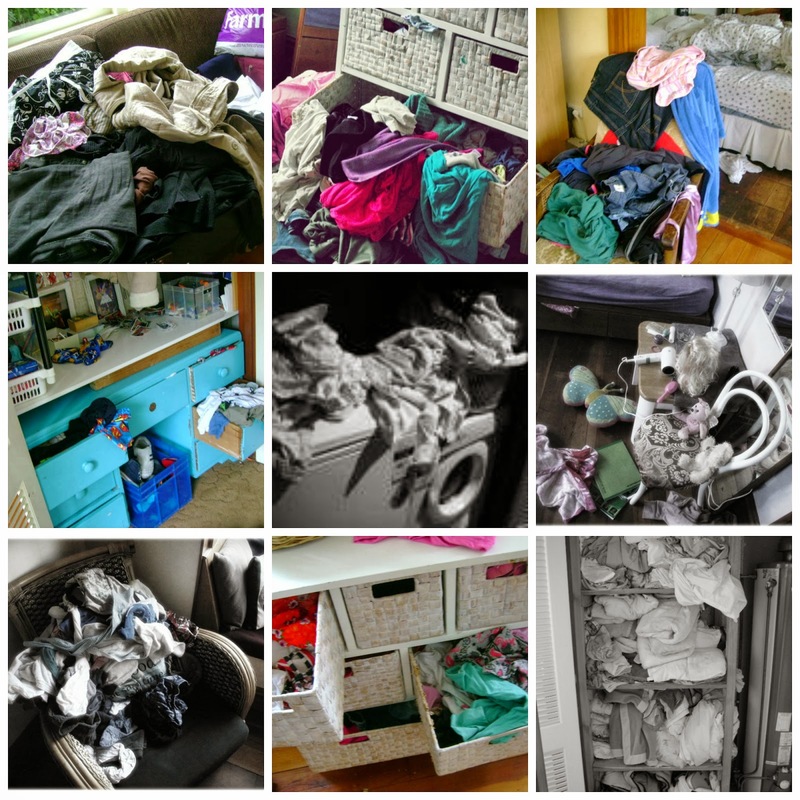 In that first brief half hour session, Natalie gave me enough tips to get me started on decluttering and reorganising two of my worst problem areas (my Laundry-in-a-cupboard and my linen cupboard) without spending much at all. So without further ado, here we go... the Spring Declutter begins...! My laundry is in a cupboard. Behind those bifold doors lurked a hoarder's delight. On one long shelf was stuffed every conceivable object-without-a-home: Soccer boots, swimming goggles, paint cans and broken waiting-to-be-fixed toys, all competing for space with boxes of washing powder, rampant cleaning-products and half-opened packets of toilet paper. It was a case of "open the door and pray it doesn't all fall on you". Hear a knock at the door and run to click those doors shut to hide the shame. Looking for something you need in there? Good luck with that. With some helpful suggestions from Natalie on that first initial visit, I was able to declutter and transform my diabolical laundry nightmare into something I'm proud to show visitors. In fact, usually when I attempt to declutter myself, it will last for only a week or two and then return to it's natural (messy) state. Not this time. My Laundry cupboard has been pristine now for nearly two months. It's some kind of record. And a miracle. The trick, according to Natalie, is having "a place for everything, and everything in its place". Get rid of everything that doesn't belong there. Sounds obvious, but this is the first and most-important stage. Throw out what is broken, recycle or donate items you don't want but which might be useful to others, re-home items like paint tins and sports gear in the garage where they belong! Create extra shelving/storage space using cube shelves turned on their side. 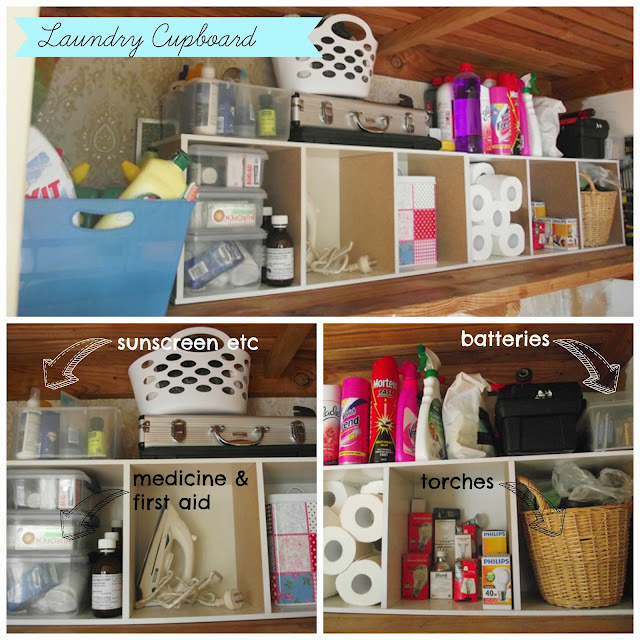 This gives a whole extra long "top shelf" and helps keep items organised in the "cubby holes". Cleaning products: keep these all together in a bucket, so you can just grab the whole thing and take it where you need it. 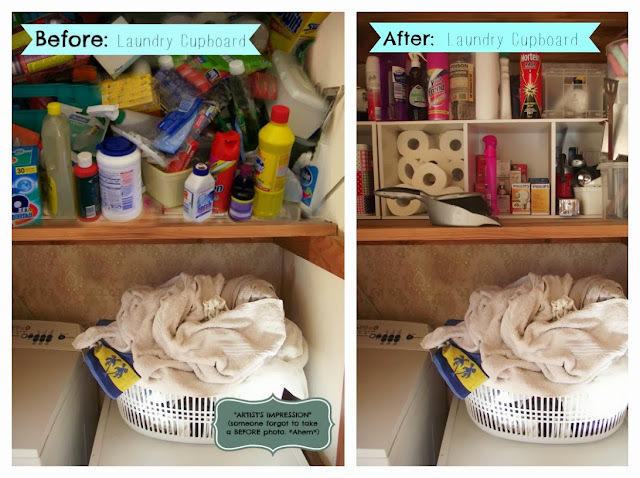 It also helps your cupboard look tidier. Once everything has a place, you can easily see what you are running low on, making shopping easier and eliminating double ups. Family-members will be less likely to dump stuff in a well ordered space where there's no room for dumping because everything has a place. It will also be easier to find what you are looking for... batteries, mozzie spray, sticking plasters, a torch during a power cut. Brilliant. I have tidied this cupboard so many times over the years I've lost count, and frankly I'd given up. We are so ridiculously short on space there seemed to be no way to fit it all in and keep it stacked neatly. I've tried lots of things, including Martha Stewart's tip on folding top and bottom sheets in a pillowcase and storing sheets in sets. Nothing lasted. The reason was plain: Too much stuff, not enough storage. 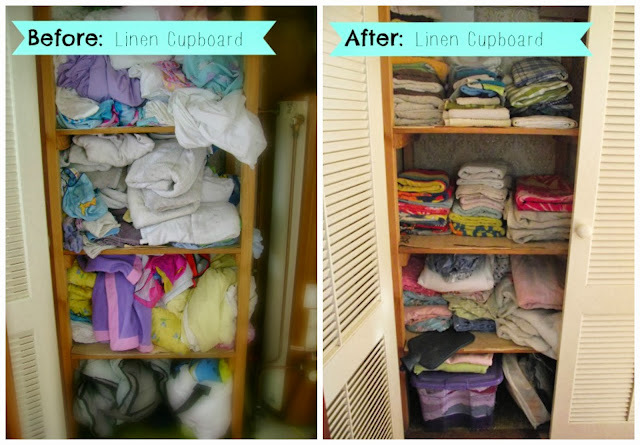 Natalie's solution has revolutionised my linen cupboard. Again, it is still neat and tidy after six weeks. I can fold the towels and put them away without drama. I can find the sheets when it's time to change the beds. I even have room for tablecloths which had been homeless for years. The trick? 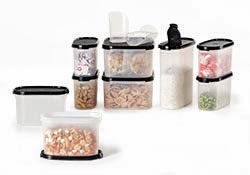 Purchase a couple of "rolling storage containers" and sort sheets into "Summer" and "Winter". When the winter sheets are in use, keep the summer sheets in the box, in a cupboard elsewhere (e.g. a wardrobe). When the season changes, swap them over. Do the same with the duvet covers: keep them from taking over the linen cupboard by condensing them into a container and sliding that into the bottom (usually unusable) shelf of the cupboard. Suddenly you have a whole lot more space. And a whole lot less mess. So simple, but so effective. It works. Mess comes from having too much stuff and not enough space. So declutter. Make a place for everything, and everything in it's place. Then take a deep breath and step back to admire your neat and tidy cupboards. Even weeks months later. The Tupperware Giveaway starts now! There are TWO Pantry Starter Kits to be won: one for a New Zealand reader and one for an Aussie reader! Use the Rafflecopter widget to enter. SERVICE ANNOUNCEMENT: I have fixed the viral links!!!! It wasn't the Rafflecopter gadget - Rafflecopter are INNOCENT. It was a Viral Planet script - you can bet I won't be working with them EVER. YAAAAAYYYY!! My blog is back! NEXT: The Pantry Declutter Part One!